This taps into a widespread view that emerges whenever high-rise apartments are discussed in the United Kingdom, and which was expressed with stunning opportunism after the fire by veteran conservative journalist Simon Jenkins and the campaign group Create Streets, which is closely linked to the Tory think tank Policy Exchange. It is perennially demanded that 1960s and ’70s era buildings are torn down, but in the case of Grenfell Tower this overlooked two important facts. The first is that increasingly, London’s skyline is as dominated by new towers — “luxury flats” and student dormitories — that are often steps backwards to their predecessors in terms of space, air, light, and design. The second, most crucial of all, is that if nothing had happened to the tower since the early 1970s when it was completed, barring basic maintenance and care, this fire would have been impossible, with all accounts so far agreeing that the main cause was almost certainly botched and cheap recent work on the building. This is not Britain’s first tower block disaster — the country’s record is poor, from the Ronan Point collapse of 1968 to the Lakanal House fire of 2009. Towers are uniquely emotive here, either concrete eyesores concentrating poverty, or a Dubai-on-Thames owned by unknown foreigners — without an opportunity to be treated as what they usually are, a normal form of housing that is standard on much of the planet, that has flaws and virtues just like houses do. There is an enduring association between high-rise housing and social democracy in Britain, which is sometimes seen positively — as an example of the futuristic “white heat of technology” of Harold Wilson’s reforming 1960s government — and more often, negatively, as a form of totalitarian social engineering with architects devising machines for living in that they would never dare live in themselves. Neither of these is strictly true. Britain’s first multi-story buildings are mansion blocks, street-facing apartments built in the late Victorian years in affluent areas like South Kensington and Maida Vale, not so much for the middle as for the upper class. The first towers to be based on the ideas of the Modern Movement about egalitarian social buildings standing in green public space were for a very similar clientele, beginning with the Soviet emigre and devout communist Berthold Lubetkin’s Highpoint flats, in North London. Lubetkin himself moved into the top floor of the second block, Highpoint 2, in 1938. A handful of others followed before the war, like Wells Coates’s Embassy Court in Brighton, which housed actors and celebrities. It bears repeating that if high-rise living was an experiment on the part of middle-class socialist architects, it was one that they first carried out on themselves. The wave of council blocks that followed were based on these principles. High-rise construction progressed tentatively after Labour’s landslide victory in 1945, though towers appeared in many ideal town planning projects, as images of what the socialist future might be like — everyone with an equal view, of the sort usually enjoyed only by aesthetes with penthouses, of a new landscape of publicly owned, free open space. The most influential tall projects built under Clement Attlee’s government’s watch were the Churchill Gardens estate on a bomb site in Pimlico, not far from Parliament, and The Lawn, a lone tower in parkland in the New Town of Harlow. Unlike any of the interwar high-rises, these were for council tenants, publicly owned flats let at low rents to locals in a given borough — analogous to American public housing, but unlike it, with better facilities than the private housing of the same period, at least at first. Aesthetically, these two defined the types of high-rise that would come to dominate British skylines in the 1950s and 1960s — the long, linear, unsentimental “slabs” of Pimlico, and the thin, elegant “point” of Harlow. The way they were planned, too, showed two possible paths — a dense, urban site filled with flats on the one hand, or spacious towers in thickly planted greenery on the other. At their Alton Estate in the mid-’50s, the Labour-controlled London County Council combined both, in a rolling landscape expropriated from the grounds of country houses. An American observer called it “the best low-cost housing development in the world.” Estates like Chamberlain Gardens in Birmingham and Gleadless Valley in Sheffield maintained this quality. These buildings, widely praised and shared as images of a confident future, were seductive — but they were not easy to build, relying on new technologies and unfamiliar skills. The most left-wing local authorities didn’t just commission their own housing — they built it, too, through direct labor organizations run by the municipality, practically circumventing the construction and house-building industry, historically close to the Conservative Party. But these organizations were not equipped to build high. In the estate where I live, in Woolwich, southeast London, built in the 1950s, the first phase was straightforward frame and infill construction, built on-site — but the enthusiasm for towers meant that the second phase was planned as a series of dramatic point blocks stepping down a hilltop — well beyond the direct labor organization’s abilities. When big construction firms, with their large budgets and access to new technologies, became aware of councils’ interest in high-rises, they acted swiftly, offering them package deals of high towers that could be erected quickly, solving the housing crises that beset most working-class districts — aftereffects of war damage and of Victorian slum-building. Noticing that there was apparently a short and simple solution to rebuilding, central government under Harold Wilson offered subsidies for tall buildings. Towers in these package deals were pieced together from factory-made parts, rather than built from the ground up. The first examples of this were stark. At Morris Walk in Charlton, the London County Council adopted the Larsen-Nielsen system, a Danish method of building from large concrete panels. The resulting assemblage of towers and low-rise maisonettes still looks strikingly machine-made, fresh off the production line — as it was, with a continuous Fordist line being used on the site. Larsen-Nielsen would become notorious when it was adopted en masse all over the country, with large panels forming the basis of thousands of towers, and Birmingham, Glasgow, and East London in particular transformed in just a few years in the mid-’60s by the lucrative alliance of local authorities keen to clear their waiting lists fast, and building firms equally keen to sell their building kits. Architects, usually blamed for the results, were some distance away at this point, their role often limited to the placing of towers rather than their design. 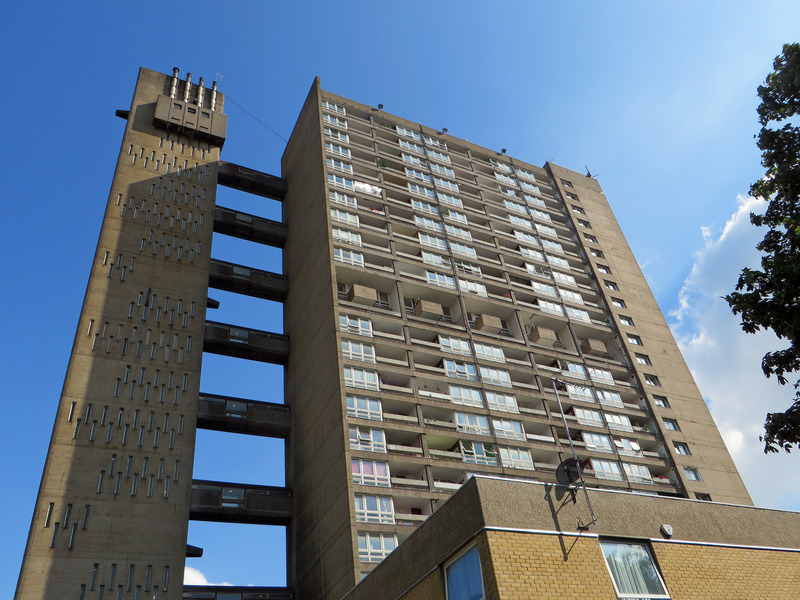 At first, councils had self-imposed limits on who they would house in towers, with single people without children preferred, but the incentives to build high and fast meant these were often abandoned. This brief moment of high-rise mass production ended with the first of Britain’s high-rise disasters — the partial collapse of Ronan Point, a Larsen-Nielsen block in Canning Town in the London Borough of Newham, in May 1968. A gas explosion destroyed the structure of the tower, with the panels falling on top of each other like a house of cards. Four people were killed, and many thousands more were terrified, as they began to wonder if their new homes, at first so obviously superior to the old, were even safe to live in. The investigation at Ronan Point revealed that underneath the modern facade, high-rise building in Britain was a dubious business, with endemic cost-cutting and poor workmanship. The blocks built by Ronan Point’s contractor, Taylor Woodrow, were revealed to be kept together by the weight of the panels, with the bolts and joints specified in the drawings left out by the builders. Old newspapers were used as insulation. This wasn’t the white heat of technology, but jerry-building on a Victorian scale. Larsen-Nielsen, which has never led to any problems whatsoever in Denmark, was designed for buildings of no more than eight stories — Ronan Point went up to twenty-two. Politicians both local and national, and in the case of Birmingham, city architects, were convicted of taking bribes from big firms such as the notorious John Poulson. Much of the impetus of the post-1968 New Left in Britain came from revulsion at the tower boom of the 1960s, seen as the result of top-down Tammany hall politics and corruption. This was a simplification, ignoring the many high-quality towers built when councils had the confidence (and the cash) to avoid the system-builders — from Erno Goldfinger’s Trellick and Balfron Towers to one-offs like Anniesland Court in Glasgow or Point Royal in Bracknell New Town — and the fact that some were being explicitly aimed at a luxury clientele, such as the City of London’s monumental Barbican Estate. Looked at today, some of the anti-tower rhetoric of the ’70s and ’80s sounds hysterical, extrapolating from wholly contingent problems into sweeping generalizations about totalitarianism and sinister architects using council tenants as guinea pigs. Towers were built less and less from the early 1970s on, only returning in the early 2000s. What was most damaging about this debate was the fact that the really guilty parties of Ronan Point and its ilk — Taylor Woodrow, and companies like it — were not only exonerated, but almost totally ignored. They continued to profit and thrive, and began to maintain lengthy blacklists of trade unionists who might blow the whistle on their dubious practices. One result of this was that towers looked better on a superficial level — shinier, often clad with indistinct new materials on top of the original concrete, mostly for reasons of thermal insulation; another was that the strings attached to the program — the imperative for elected councils to either offload their housing onto charitable housing associations, or to housing quasi-autonomous non-governmental organizations known as Arms-Length Management Organizations (ALMOs) — made who actually owns and runs what was now called “social housing” increasingly opaque and unaccountable. The first of the towers for the new rich that Thatcherism created was built at the end of the 1980s as part of the Docklands development, an immensely successful boondoggle based on the tearing up of planning regulations on a post-industrial site, the opposite of the careful modernist planning dreamed of after the war. Cascades, designed by the postmodernist architects CZWG, was meant to look unique, exclusive, and to use the New Labour parlance, “aspirational,” defined not by structural concrete and flat roofs but by “quirky” roofs and multicolored cladding. Beginning in 1997, hundreds of towers like this were built, to the point where they dominate boom cities like Leeds, Manchester, and Reading as much as ’60s towers once did Birmingham and Glasgow. The realization that towers, with their epic city views, could be sold as “luxury” meant that some councils balanced their books by “decanting” selected high-rises of their working-class residents and selling them to property developers. Such has been the fate of several high-rises in London, Leeds, Sheffield, and perhaps grossest of all, Manchester, where three “hard-to-let” towers were re-clad by the “creative” developers Urban Splash, and named (in neon lights) after the women’s suffrage activists, the Pankhursts — Christabel, Emmeline, and the passionate communist Sylvia. Dispossession under New Labour often went hand in hand with radical chic. But few worried they would be unsafe — though one of the most widely built types of new towers, student housing blocks, have been built to standards as poor as those of the 1960s. Again, the debate has been largely aesthetic, as height became a signifier of power and affluence, rather than of being condemned to live in a dated architect’s dream. The results of the latter could, after all, be privatized into the former. The 2009 fire in Lakanal House, a slab block on the pleasant Sceaux Gardens estate in Southwark, revealed that a new danger to the residents of 1960s towers was poor improvement work, with suspended ceilings and faulty power installations contributing to the unexpectedly fast and deadly spread of a routine flat fire. Investigators recommended the fitting of sprinkler systems on “social” towers, and were ignored. But this isn’t why the Grenfell tower fire was so drastic and so lethal. Investigations will take years, but what seems clear is that the ALMO charged with looking after the tower had, as the residents’ blog tirelessly pointed out, a record of hazardous practices in the block’s communal spaces — and shockingly, that the cladding, installed in a recent renovation by the contractor Rydon, was flammable. It would have cost an extra five thousand pounds to install non-flammable cladding panels instead, but the budgets of councils and ALMOs are low and deliberately handicapped by arcane rules about “value engineering” and a culture of institutionalized meanness. It may be a minor issue in the face of the horror of the Grenfell fire, but it is depressing to see the clichés of the 1970s being repeated in its aftermath. Not just because of the irrelevance of the architects versus the masses narrative — one of the seventy-nine people killed in the fire was an Italian architect who had moved into a Right to Buy-privatized flat for the view — but also because of what it might mean for the tenants of council towers, especially those in expensive, gentrifying areas like North Kensington, whose working-class, multinational residents already feel like they’re treated as substandard citizens. It is easy to imagine a shock doctrine response to this massacre. Councils are already evacuating blocks clad with flammable material by Rydon. They have little money, crippled both by New Labour’s suspicion of local government and by Tory austerity. Many may opt to demolish, or to sell up to developers who can promise to properly refurbish the blocks — at a price, of course. Contrary to what Sadiq Khan argues, the consequence of the fire might be not that the “mistakes” of the 1960s and 1970s are demolished, but that the mistakes of the 2000s and 2010s are continued, as ’60s “mistakes” are transformed into aspirational “solutions” for a better class of resident. Then, the people who once had, for all their poverty, commanding views over Western Europe’s most unequal city, will be moved far out of it, to distant towns and cities where the rich won’t have to look up at them.